Common snapping turtles (Chelydra serpentina) are large, freshwater turtles native to North America. Snapping turtles can normally be found at the bottoms of muddy ponds, rivers, marshes, lakes or any permanent freshwater habitat with ample aquatic vegetation. Although these large turtles are most comfortable in the water, they lay their eggs on land. Snapping turtles mate between April and November, and are most active in breeding during warmer months. They begin courtship by facing one another and moving their heads from side to side. Mating begins with the male mounting the female and adjusting his tail beneath the female's to allow the cloacal openings to touch. 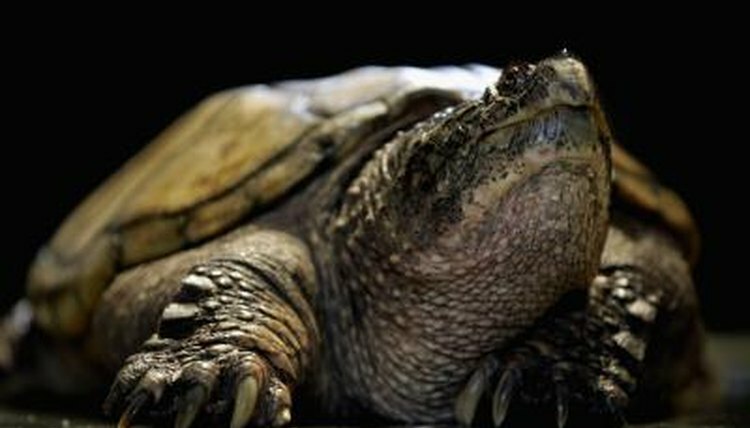 A female snapping turtle may keep viable sperm in her body for several years, so that eggs are fertilized even in years when she does not mate. A female snapping turtle will typically lay her eggs in early summer. Depending on when she mated, egg-laying may extend into autumn. She chooses a nesting site in an area of loose soil, sand, loam, vegetation debris or sawdust, where she digs a nest 4 to 7 inches deep. She will lay 20 to 40 soft-shelled, cream-colored eggs roughly the size and shape of a table tennis ball. Snapping turtles will generally dig their nests during the mornings and evenings; in some parts of their range, however, this behavior only occurs in the morning. According to former Missouri state herpetologist Tom R. Johnson, up to 84 percent of snapping turtle nests are destroyed by predators such as minks, raccoons and skunks. Hatchlings will emerge from their soft shells 55 to 125 days after the mama snapping turtle lays the eggs. The time to hatching is longest in the northern part of the snapping turtle's range. Generally, incubation takes from 75 to 95 days, and hatchings emerge between August and October. Occasionally, hatchlings don't emerge from their eggs until the following spring, but this overwintering is rare, especially in the north. The hatchling snapping turtles are typically around an inch long when they emerge from their shells. Males reach reproductive maturity at around 5 years, when their upper shell, or carapace, reaches about 6 inches long. Females reach reproductive age at between 4 and 7 years. As with many reptile species, egg temperature during a critical stage of embryo development determines the gender of the snapping turtle hatchling. According to Scientific American, cooler temperatures at that stage produce males, while eggs incubated in warmer temperatures will produce females. Scientific American: How Is the Gender of Some Reptiles Determined by Temperature?